BYU became the first team from the state of Utah to beat Boise State and they did it in convincing fashion, dominating the Broncos 37-20. You’re welcome Aggies and Utes, though we didn’t do it for you. Yes, you may ride our coattails and feel pride that someone took down your hated Boise State, but the victory is ours and ours alone. Led by a surprising first half onslaught which saw the Cougars roll up 306 yards of total offense, BYU dominated from start to finish. 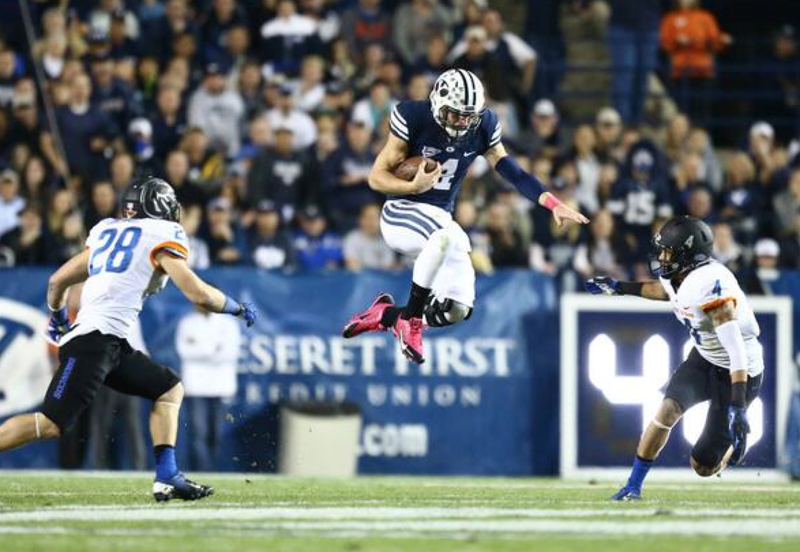 Taysom Hill had another stellar game for BYU. Both throwing the ball (27-41, 339 yards, 3 TDs, 0 INTs) and running the ball (18 rushes, 69 yards, 1 TD), it was Taysom who drove the ball up and down the field on the Broncos, leaving BYU with a dominating victory. On a night when WR Cody Hoffman became the all time leading receiver in TDs it may have been Taysom who was the best receiver on the field. While registering zero “official” catches in the game, Taysom caught several poor snaps and continued the play as though nothing had ever happened. As opposed to the first three games of the season where BYU struggled to throw the ball well, it really seemed like BYU receivers are dropping the ball much less. Passes are arriving on time due to accurate passing and timely pass route running. The ball is hitting the grass much less. One of the most improved pieces of that has been Ross Apo. Apo, to me, has not lived up to the hype surrounding his recruitment. The past several games he has become not just a reliable pass catcher, but also a “big play” guy. Apo had a sweet 37 yard TD catch in the first half that put BYU up 17-3 with just under four minute before halftime. Contributions from guys like Apo have really helped BYU’s offense get rolling and man, is that fun to watch! Even the offensive line that gave up eight sacks last week against Houston improved, giving up just one sack against the Broncos. Go Fast, Go Hard is really living up the billing that many optimists expected to dominate from Game 1. The defense continued to be a “bend, don’t break” defense, allowing nearly 500 total yards by Boise State. Four turnovers and stopping the Broncos three different times on fourth down kept the Boise scoring low. BYU led 24-3 at halftime and 34-13 going into the 4th quarter. Given the injuries that have ravaged the Bronco’s D since spring camp, “bend, don’t break” works just fine for me. Uani ‘Unga led the D with a HUGE night, racking up 15 total tackles. Alani Fua added 13 as the linebacking corp continues to be the anchor on defense. The Cougars did, however continued their injury plague. Daniel Sorensen went out in the first half with a concussion and Mike Hague joined him in the fourth quarter with a concussion of his own after appearing to separate his shoulder earlier in the game. A big comeback for Craig Bills was seen in a forced fumble after missing the Houston game. But he redeemed himself by making three field goals. He has now more field goals this year than he last year, which speaks to the improvement that he has made. You know, I really admire the kid. He had a rough couple of seasons and it would have been easy to just hang up his soccer cleats and just said football wasn’t his thing any more. He overcame his bad kicks and has actually become a fairly reliable point scorer. BYU will travel to the Midwest the next two games for tough matchups with Wisconsin and Notre Dame before finishing up the season at home against Nevada.